The injury often occurs when runners bump up their mileage too quickly, introduce speed sessions or sprints, or suffer a fall that directly injures the piriformis muscle. This is an injury that can sideline runners for weeks or months at a time. Ouch! 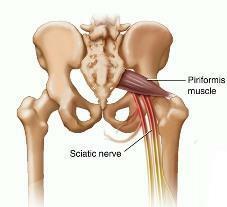 Piriformis syndrome is a painful and sometimes serious injury that causes pain around the hip joint and the buttocks. The injury occurs in the piriformis muscle, a thin band of muscle that originates at the sacral spine (back of the pelvis) and attaches to the greater trochanter of the femur (the big, bony "bump" on the outside top of the thigh). The injury often occurs when runners bump up their mileage too quickly, introduce speed sessions or sprints, or suffer a fall that directly injures the piriformis muscle. This is an injury that can sideline runners for weeks or months at a time. I know that's not what you want to hear if you are suffering now. But, there's good news: A focused stretching and strengthening program can help fix you. The beginning signs of a piriformis injury may be tightness or soreness in the middle of the buttock or along the back of the hip joint. It may progress to a more pronounced feeling of a "charlie horse" over the course of a few days. The pain while running tends to be the worst when landing and pushing off. Eventually, you may feel more pain and stiffness to the point that you will have discomfort sleeping, walking/running, or sitting for even small amounts at a time. In particular, driving and sitting for prolonged periods can aggravate the injury. Because of its proximity to the sciatic nerve, an injured piriformis muscle can cause pain that shoots down the length of the leg and up to the lower back as well. For this reason, piriformis injury is often confused with a number of ailments. When experiencing pain and injury, it is always best to seek professional medical advice. Treatment begins with a diagnosis of any underlying conditions that may be causing an imbalance in running form. This may be an issue with pelvic alignment, overpronation or supination of the foot, or uneven leg length. Stretching can relieve the tightness and ease the pain. Specific stretching routines will target the piriformis muscle. Runners should begin with gentle, 5-10 second stretches that gradually increase to longer holds over time. Be careful not to aggravate the injury by stretching the injured muscles too far or for too long. Can I Continue Running With Piriformis Syndrome? That depends on the severity of your injury and your willingness to be honest with yourself. If you are stretching and practicing good prevention techniques, you may be able to continue training at a reduced intensity. However, it's recommended that you stop running and heal completely so that you don't suffer secondary injuries as a result of compromised running form. Disclaimer: I am not a doctor, I don't even play one on TV. All advice offered here is based upon research and personal experience. Please consult with your physician, physical therapist, or other trained professionals that can help you diagnose, treat, and prevent running injuries. If you enjoyed this article, please visit Saltmarsh Running and Like us on Facebook!